IoT success starts with Business Strategy. One of the most consistent problems surfacing in our discussions about IoT is the actual scope of “what exactly is IoT and what and who does it involve”. To technical people, IoT is what they perceive it to be from their active role. It might be a cloud offering, some sensor data, a connectivity solution, a robotics solution or Artificial Intelligence application. They would all be correct but they lack the appropriate context in which to provide valid inputs. To business people, their interpretation may be “it’s a security nightmare” or a “huge opportunity”. The scope of IoT has to be addressed and communicated at the right levels for each of the stakeholders. Who in the organization should lead this and how will they manage the variables? Should IoT be left to the CIO to figure out as a project or should Business Strategy drive the impetus for solutions? In our research to find a “common denominator” of how to approach IoT for Business Strategy, we found a great resource that we feel will assist all members of any IoT initiative- from the top down and then across to IoT Product Managers. We reached out to Daniel Elizalde, Founder of TechProductManagement where he trains Product teams on how to manage any IoT Product. He also teaches the popular course “Product Management for the Internet of Things” at Stanford Continuing Studies. The need for this program was identified since this huge gap in understanding and the multitude of technologies, business process drivers and many inter-related decisions which have to be referenced, weighed and factored into an IoT product. “The IoT Decision Framework” is the output and is fast becoming the standard modeling template in the IoT category. Beyond Product Managers, the same issues would surface for marketing and sales professionals, executives and consultants alike. If you are trying to position a product or service without the aid of this framework, you will be faced with a long and painful exercise to help a customer make decisions. All decisions have impacts within the matrix. In support of handling these issues, Daniel created the IoT Decision Framework as an online certification course. He also provides customized workshops to help companies get started on the right track. We have access to Daniel via IoT Foundry and can provide both custom workshops and the online training certification course. We feel that to provide a solid framework for adoption IoT strategies and solutions, everyone involved really need this well developed template in order to understand the issues, option and decision steps. We will be posting some of the informative articles Daniel has developed for your consideration of this option for your company or personal certification. If you plan to be offering any sort of IoT solution development, consulting or product implementation or support services, this course is for you. For the record, I have completed the course. Like many well created courses, it brings together all of things you may have awareness of, but need a reference to make critical path decisions and get buy in from your particular stakeholders. (UX, Data, Business, Technology, Security, St andards & Regulations). Armed with this framework, you’ll learn to identify make-or-break decisions you may not have considered, and uncover pitfalls before you invest time and money going in the wrong direction with your product. 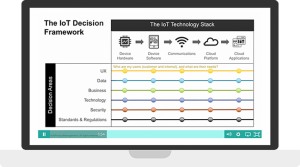 I have to say the IoT Decision framework of Daniel’s is the only one in the industry that tightly connects with every strategic decision overarching the entire IoT landscape. My big take-away was the wide spectrum of product decisions that need to be made including priorities, costs, strategic direction, etc., and the ramifications and interconnection of those decisions.